New York Yankees star slugger Aaron Judge is no foreigner to the outfield fence, whether it’s defensively or offensively. He regularly sends probes over 400 feet from home plate to investigate the bleachers. In 2018, he completed 27 expeditions, also known as home runs, into outer space. The expectation for Judge is to continue smacking homers while racking up a ton of strikeouts, and that’s justified, but the Yanks were one of the worst offenders when it came to leaving runners in scoring position last year. Moving forward, improving contact rate and lowering strikeouts will be the priority for the big hitters. Sacrificing homers for strikeouts has been supported in recent years, but improving upon fundamentals and practicing can help balance the scale. Judge missed nearly nine-weeks of baseball last season in what was another dominant year at the plate. Despite his strikeout totals (152), he finished with a .278 batting average. When factoring the games he missed, he was on pace for 201 strikeouts (compared to the number of at-bats he had in 2017 – 542). Essentially, he would have struck out seven fewer times last season than in 2017, a very marginal number that can be considered flat. Lowering the number is the focus in 2019, and Judge has begun taking the steps to improve his contact rate which in terms will increase base-hit efficiency. 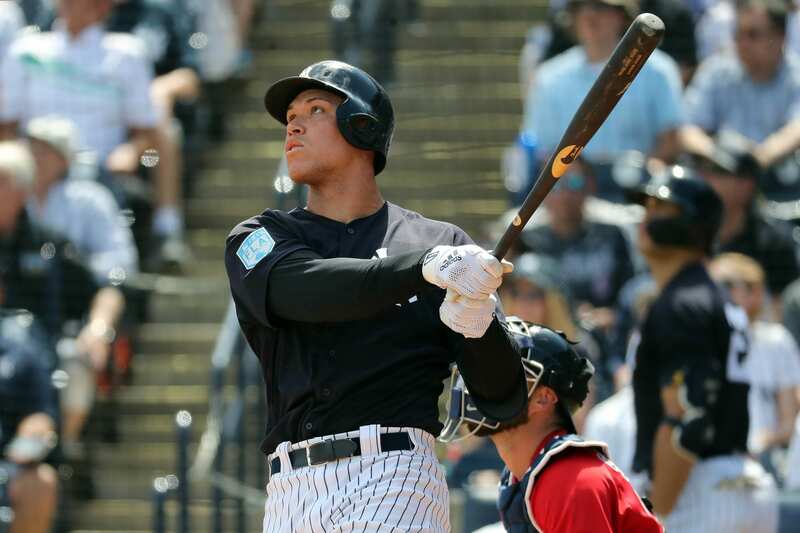 What has Aaron Judge done to improve his contact efficiency? The Yankees’ right fielder has changed his swing, or specifically his front-foot when going through the motion. In the past, Judge would lift his front-foot to add more power to his swing. This spring, he has experimented with keeping his front-foot planted on the ground to activate his core to maintain balance. They had 4 outfielders for @TheJudge44. During Grapefruit League play, Aaron is hitting .333 in 30 at-bats with six homers and eight strikeouts. If you take that small sample size and compare it to his 2018 numbers, we can see that his strikeout rate dropped from .38 to .26. That’s a significant margin that would have seen him strike out 107 times instead of 152 times. While we can’t take spring numbers and convert them to regular season stats that easily, there’s a clear improvement here that we should be excited about. Judge could have his most dominant season yet in 2019.